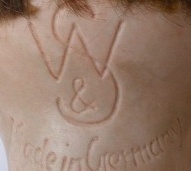 Johann Walther doll factory was founded in 1900-1930 of Germany, they advertised dressed dolls in 1900, used the doll mark IW intertwined. 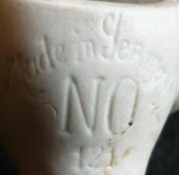 By 1908 Johann Walther became a partner with Nikolaus Oberender, which produced bisque doll heads and small all bisque dolls (see below for Oberender doll marks and mold numbers), by 1910 the partnership dissolved and each went their separate ways, each with their own porcelain factory. 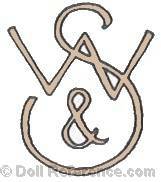 In 1921 Johann Walther registered his company name as Walther & Sohn in Germany continuing to use the IW mark, as well as the WS mark. 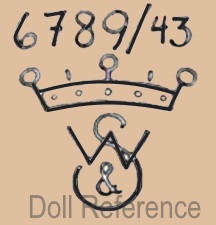 identified, plus their doll mold numbers. 15" tall, bisque socket head, painted feathered eyebrows, sleep eyes with painted upper and lower eye lashes, slightly open mouth with a five piece composition jointed body with bent limbs. 8 1/2" tall, bisque socket head, with a composition five piece jointed body, fixed eyes, open mouth. Doll is dressed in a traditional plaid Scottish outfit. 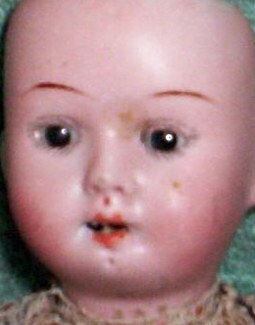 Tiny 8" doll with a bisque head, painted single stroke eye brows, stationary glass pupiless fixed eyes, painted upper and lower eye lashes, open mouth with teeth, chin dimple, with a five piece jointed composition body. 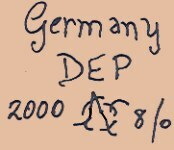 Nicholas Oberender founded a porcelain factory with Johann Walther in Oeslau, Thüringia, Germany in 1908, by 1910 the partnership dissolved and each went their separate ways with their own factories. 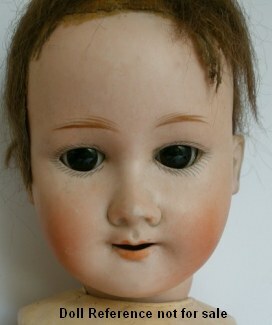 In 1910 Oberender's porcelain factory employed 110 workers making bisque doll heads. 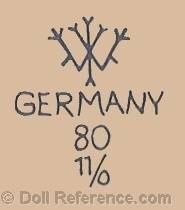 By 1927 the company was known as Wilhelmine Oberender.